Disney is a dream vacation for families and something everyone wants to give as a experience for their kids. Who wouldn’t want to see Mickey Mouse and all the princess magic in person? But….it can be a pricey experience. Put aside the boring reality of everyday and step in to the Magic Kingdom with these tips on how to Visit Disney with a budget. The more in your group of travelers the more important it is to avoid flying. The cost of tickets really adds up for a large group, but if flying is a cost effective option for you use a great travel website! *Ask a neighbor or family member to take you to the airport and pick you up upon your return. Even the cheapest places to park car adds up over the course of a vacation. If someone does this favor for you, be sure to offer to do the same for them! *Take your own snacks. You are a captive audience when you get behind the security area of an airport. With few options, companies often charge an arm and a leg for simple snacks! Bring your own snacks in your carryon luggage. *Do not buy drinks. You can NOT take liquid through airport security, but you CAN take an empty water bottle. Water from water coolers is FREE!! Take your own powdered drink if you want your drinks to be more special than water. There is a HUGE variety of powders to add to water. *Don’t pay for luggage! Be very careful about the rules on how much luggage can weigh before the airline charges extra. For the price of a small luggage scale you can save big bucks on overage luggage fees! *Pack the heavy things in the carryon. For some reason, understood only by the airlines themselves, there is no weight limit on carryon bags. *Know the rules. You are often allowed to carry a personal item, such as a purse, camera bag, or laptop bag, in addition to a carryon. This gives you another spot for you to carry something heavy for free. *Think outside the box. If you are really wild about saving money just FYI – there are no rules about how much clothing you can wear on a plane. There are probably some rules about how…little you can wear 😉 but nothing about how much you can wear! So..if you are up to it add leggings under your skirt and for sure wear your coat. There is no penalty for carrying your coat either. *Pack light. Perhaps it goes without saying, but consider paying light. The less you bring, the more room you have to bring souvenirs back! Also, if you pack light you don’t need to pay anyone to help with your bags nor do you need to rent one of those luggage carriers. The larger your traveling group, the larger your savings when you drive instead of fly. But, just saving on tickets isn’t all the makes driving a better option. *Get the best price on gas. Gas Buddy is a great way to start any trip. This wonderful website/ap can be used two ways. Find the cheapest gas. Just type in the zip code to find the lowest prices. Stack the savings! Do you have a rewards card? You can use BOTH the rewards card AND the Gas Buddy card! Gas Buddy will work with all stations EXCEPT: Exxon, BJs, Costco, Sam’s Club, H-E-B, and SOME Walmarts. *Plan the Route Carefully! You can easily choose the best route according to things you want to see along the way, the shortest route and/or the route with the least traffic. Use the Trip Cost Calculator on Gas Buddy. You do NOT have to join anything to benefit from the trip cost calculator. Just type in your information and the route will be calculated according to the cheapest gasoline prices along the way. You even put in your vehicle information to get the most accurate information possible. Plan the trip with cool stops along the way with Route Planner! This cool website helps you avoid traffic and choose the smoothest route possible. Roadside America – I love the crazy and cool things you can find with roadside America!! Use the map of your state to see where you’ll want to stop along the way. Stretch your legs and learn a little while you are at it! For example, check out the cool Road Side Attractions in Florida for cool stuff to see on your way to Walt Disney World! CLICK HERE – We found the very cool Cathedral of Junk in Austin, Texas by researching Roadside America. *Benefit from a car while you are at Disney. You can use your car around town once you are on holiday at Disney. Drive to the grocery store to stock up on cheap meal ingredients! Planning a Trip To Disney Land on a Budget: Choose a low peak time to visit the Walt Disney resorts. When you travel off peak times, you can potentially save a bundle on hotels and have the added benefit of less crowds in the parks! Check out the crowd calendars to choose the best time for your family vacation to Disney! Try these websites to find great deals on hotels. WARNING: Trip Advisor has had some recent negative press. They have been accused of deleting negative reviews from travelers who have had safety issues at their recommended hotels. I really enjoy Trip Advisor and hope they change their ways to include safety related reviews. Thankfully we have not had any problems at all. It would be a good idea, if you choose to use Trip Advisor, to seek a second source of information on a hotel until they get this reporting issue resolved. Safety first! 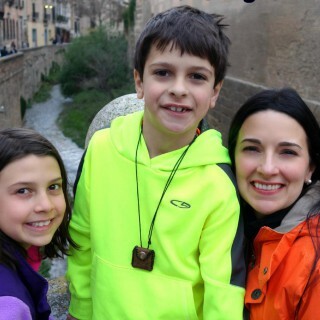 Off season times at travel destinations often mean the kids are IN school. Don’t be afraid to miss school for the trip of a lifetime no matter where you are headed. There is plenty to learn on a trip starting from the transportation (Do you know how planes actually fly?) and continuing through the new cultural things you’ll encounter (Read about cultural norms here!) and magical experiences that are a BIG part of the US culture like (Like Disney) you’ll have plenty of educational opportunities. CLICK HERE to read : How to Talk to School about Absences for a Family Vacation. Planning a Trip To Disney World on a Budget: Stay ON the Disney property. Now I know I just suggested staying OFF property to save money, but staying ON property can be cost effective, too, and they have some really amazing perks to consider as well! *Stay at budget Disney hotels. Each hotel level has wonderful opportunities and amenities, but the more time you spend IN the parks AWAY from the hotel, the less those things matter. When the kids were small, we had to come back to the hotel to rest in the middle of the day. This way we could go back out and enjoy the evening fun in the parks including the fireworks! But, the older the kids got the less that mattered. For us, the hotel only needs comfortable beds to collapse into at night!! A budget hotel is perfect if that is all you need. *Consider Parking Fees – If you stay at a Disney property you’ll get FREE transportation to the parks each day. That alone will save you $20 a day in parking. All the parks charge $20 a day for parking. *Consider Camping! Tent camping at Fort Wilderness is the cheapest way to see Disney. Visit the rate calendar for Fort Wilderness to check the rates during your family vacation. You can also rent cabins and bring your trailer along. Camp fires, swimming pools and movie nights are all a part of the fun. You can put two tents and as many as 10 people in a campsite! The fees depend on the day but range from the very rare $55, more common Low $60s to the high season fees in the $120s. That is SUPER cheap! *Extra time in the Park! If you stay on Disney property you get Magic Hours in the parks. See the list of Disney resorts that give extra Magic Hours. Plan carefully for the best experience with Magic Hours. The parks all have different options for extended hours and for the amount of rides that are available during the time. Not everyone has the stamina to be up and at the park REALLY early or staying REALLY late so choose carefully! Planning a Trip To Disney on a Budget: Make the MOST of your time! You can not just stand in the middle of Disney and say, “What do you want to do? ?” “I don’t know? What do you want to do?” because if you wait until then to make a plan you’ll wait in way too many lines and miss out on some of the cool stuff! Did you know? There are Disney folks who study which day you should go, what time you should ride each ride to wait the least amount of time? But, don’t worry about figuring any of that out yourself. Instead…go to the source of all things magical, the Pixie Dust Queen, and have her plan all the nitty gritty details of your trip for FREE! CLICK HERE – to learn more about the Pixie Dust Queen and how she can help you plan the details of YOUR Disney adventure FREE. Can’t get enough Budget tips for Disney? You are in luck!! Coming soon – 5+ MORE tips you need to save money on planning a budget trip to Disney! The Pixie Dust Queen and The Educational Tourist are blood cousins. Do you think we look alike? At all? Tell us in the comments below if you have cousins that look like you – or don’t!